A bare-bones Android project contains over 1,000 files in nearly 500 folders. That’s a lot of stuff. If you expand some of the branches in Android Studio’s Project tool window, you see the tree shown. The Project tool window displays some parts of an Android app. For many examples, you can forget about 99 percent of the stuff in the Project tool window. You can focus on only a few of its branches. The app/manifests branch contains the AndroidManifest.xml file. The AndroidManifest.xml file provides information that a device needs in order to run the app. For example, an app may contain several activities. 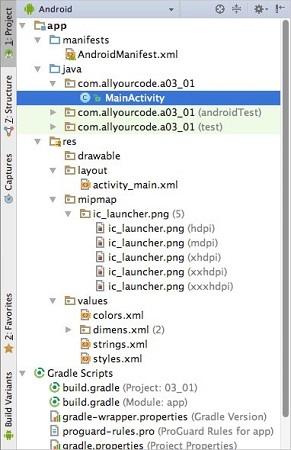 The AndroidManifest.xml file tells Android which of these activities to run when the user launches the app. The com.allyourcode.a03_01 branch contains the code that the user’s device will run. The com.allyourcode.a03_01 (androidTest) and com.allyourcode.a03_01 (test) branches contain extra code that you can use to test the app on your development computer. The app/res/drawable branch contains any regular-size images that your app uses. The app/res/layout branch contains files that describe the look of your app’s activities. The app/res/mipmap branch contains some additional images — the images of your app’s icons. The term mipmap stands for multum in parvo mapping. And the Latin phrase multum in parvo means “much in little.” A mipmap image contains copies of textures for many different screen resolutions. The app/res/values branch contains other kinds of information that an app needs when it runs. Gradle is a software tool. When the tool runs, it takes a whole bunch of files and combines them to form a complete application — a single file that you can post on Google Play. Of course, Gradle can combine files in many different ways, so to get Gradle to do things properly, someone has to provide it with a script of some kind. The heart of that script is in the build.gradle (Module: app) branch of the Project tool window. That branch describes your app’s version number, minimum SDK, and other goodies.